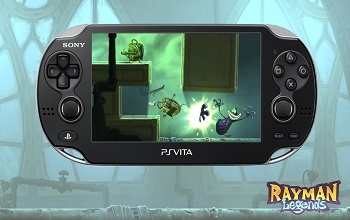 Gamers have discovered that Rayman Legends on Vita is missing 28 levels from the console versions. Despite earlier claims from Ubisoft that the Vita version of Rayman Legends would include all of the same content as the console editions, unhappy players are discovering that that may not be the case. Gamers, posting on NeoGAF, have apparently discovered that 28 twenty "Invasion" stages, levels remixed with new layouts and obstacles, are missing from the game. The missing levels also apparently reduce the overall number of collectibles in the game, dropping them from 700 to 615. The Vita version does include several exclusive touch screen challenges, but these are arguably little conciliation for gamers who bought the game rightfully expecting it to be equivalent to the console release. Currently, Ubisoft has no comment on why the Vita version is different from what the company described in earlier announcements. This turn of events is a definite shame, especially considering how generally well-received Rayman Legends has been by fans and critics alike. It's an especial problem for the Vita which, despite receiving a recent price drop, could still arguably use a better library to help hook gamers still apprehensive about investing in it. A portable Rayman Legends, much like Rayman Origins before it, should have been a boon to the system. This news, however, could lead to gamers potentially passing over the Vita version and sticking to consoles instead.